People who carry a lot of weight around their middle are at increased risk of developing dementia, say researchers. A US study of more than 700 adults showed that being overweight is associated with smaller brain volume, a factor linked with dementia. The finding was particularly strong in those with high levels of visceral fat - fatty tissue which sits around the organs, Annals of Neurology reported. More than 750,000 people in the UK have a form of dementia. The researchers from Boston University School of Medicine looked at people with an average age of 60 years old, 70% of whom were women. They measured body mass index, waist circumference and used scans to look at the amount of abdominal fat. The results showed that as BMI increased, brain volume decreased - a finding that has been reported in other studies. 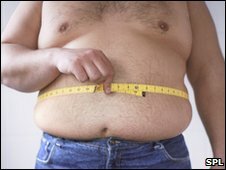 But the findings also showed a closer connection between abdominal fat and the risk of dementia. The link between visceral fat around the central organs and smaller brain volume was independent of overall weight. Study leader Dr Sudha Seshadri concluded: "Although these findings are preliminary, they could improve our understanding of the mechanisms underlying the relationship of obesity with dementia, with potentially important implications for prevention strategies." Dr Susanne Sorensen, head of research at the Alzheimer's Society, said: "We have all heard how a beer belly can be bad for our heart, but this study suggests carrying excess abdominal weight could also increase your risk of getting dementia. "This is not really surprising as a large stomach is associated with high blood pressure, cholesterol and diabetes - all major risk factors for dementia." She said more work was needed to properly understand the link between dementia and obesity. Rebecca Wood, chief executive of the Alzheimer's Research Trust, said: "These findings add to the growing body of evidence showing that mid-life health influences dementia risk. "It is never too late to adopt a healthy lifestyle and to keep weight in check. What's good for our bodies may be good for our brains."